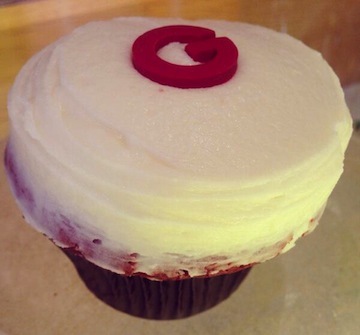 Sprinkles Cupcakes | Gluten Free D.C.
What I got: A gluten-free red velvet cupcake. I’m guessing the letter ‘G’ on top of the frosting stands for ‘gluten.’ (They should really add an ‘F’ for gluten-free.) The cupcake itself was average. Not terrible, but I’ve definitely tasted better. Overall vibe: The Georgetown location is a bright space right in the middle of M street. The extremely friendly staff (probably due to a sugar rush from too many cupcakes) took the time to explain the flavors and prices. 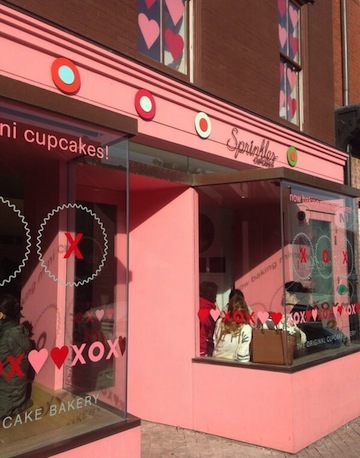 Seating is limited, so your best bet is to take the cupcake to go and walk along the nearby canal. This entry was posted in Chain and tagged Cupcake, GFDC, Gluten-free diet, Gluten-free food, GlutenFree, GlutenFreeBakery, Red Velvet, Sprinkles, WashingtonDC. Bookmark the permalink.